I recently made the decision to migrate from MySQL to PostgreSQL (the reasons why to be covered later). I thought I’d just jot down my notes on a tool I tried which helped with the migration – SQL Workbench/J Data Pumper (no sniggering at the back..). My MySQL database was running on Amazon RDS. I first created a new PostgreSQL instance on Amazon RDS and created the basic Table structures (I’m using JPA/Hibernate in my app – so this was just a case of updating my JPA config and pointing it at the new PostgreSQL instance and let it create all the tables for me) – the benefits of ORM! I then needed to migrate the data over. I didn’t have a huge amount of data (in the region of a few hundred/low thousands across a number of tables). 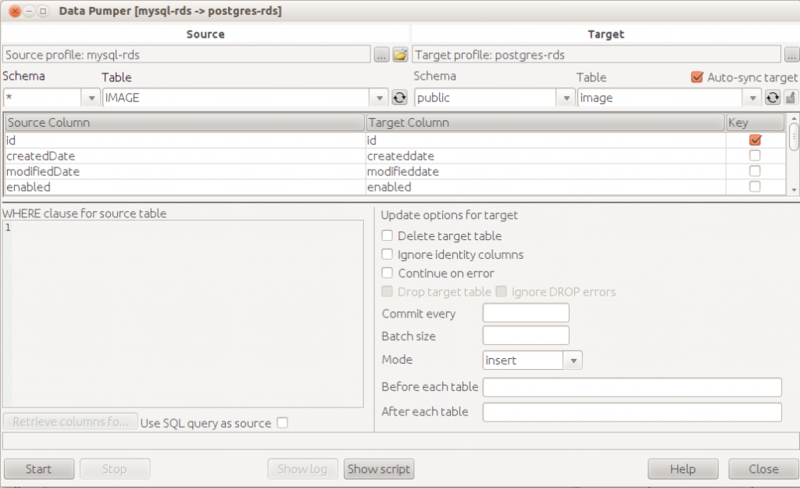 I was initially going to just use mysqldump – possibly to a csv and then just import this into Postgres. However, I had a few issues getting the data out this time (I’ve used mysqldump before on a semi-regular basis – so not sure exactly what the problem was this time – though it was the first time I’d used it on RDS with MySQL 5.6). 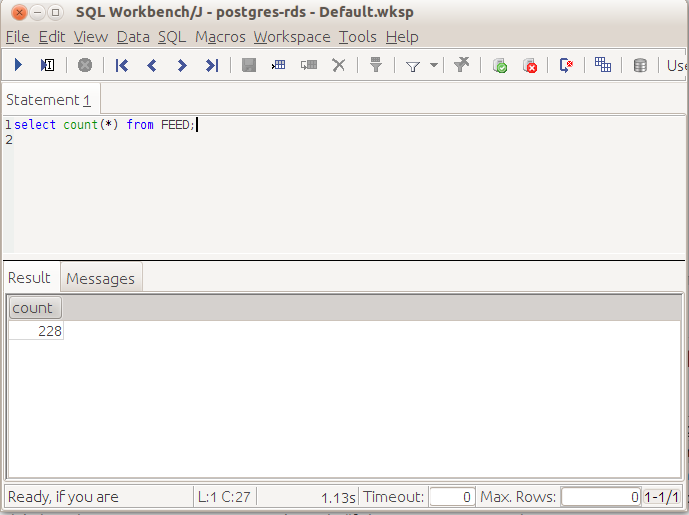 As I was moving away from MySQL – I wasn’t particularly bothered about getting to the bottom of this – so changed tack and thought I’d give the SQL Workbench Data Pumper a whirl. It worked really well – and is a great little tool for jobs like this (undoubtedly not the best tool of choice if you had large datasets and remote systems – but for small ‘hacky’ jobs like this it was ideal). 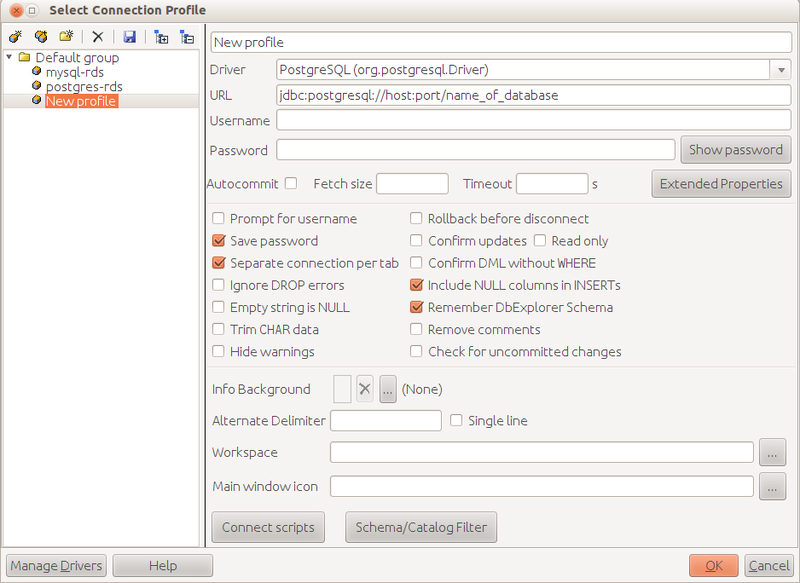 Select Source connection in top left (MySQL in my case), and Target connection in top right (PostgreSQL). Select the Source and Target tables and field mappings, and then click the ‘Start’ button. Bingo – data transferred! Simple and easy to use. I’d definitely use it again for small jobs like this – useful to have in the toolbox (and supports a wide range of database platforms). ← MongoDB in 3 Easy Steps!